Turapür water contains free hydrogen, an antioxidant which research suggests can help give you energy, generate radiant skin, and even help keep your joints healthy. Turapür water combines the research of Japanese scientists with filtration that creates great tasting water that revitalizes your cells from the inside out. Now you can enhance your health simply by drinking water! With the Turapür Countertop two stages of filtration, you’ll be able to transform average tap water into the antioxidant fountain of energy whenever you like. The initial layer of filtration is a full inch of special KDF Process Media, which is backed by 15 patents and an NSF International certification. The second layer is Nuchar® AquaGuard® 325 - A high-activity, abrasion-resistant, small-mesh granular activated carbon that’s 8-10x more absorbent than regular activated carbon. Then in the final stage, magnesium, infrared ceramics, and tourmaline enrich the water and hydrogen is freed for your body to use. As a result, the water is transformed into the hydrogen-rich, antioxidant fountain of energy. You get the benefits every time you take a refreshing sip. Removes bad tastes and odors. Produces great tasting water rich with free hydrogen. Attaches to your kitchen sink faucet providing immediate access. 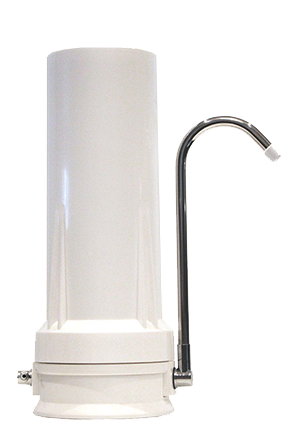 Produces alkaline water around 9 pH. Can Turapür water be used for cooking? Yes! We highly recommend using Turapür water every time you cook, for a more delicious flavor. How big is the Turapür? The Turapür is 3.5 inches wide and 11.5 inches tall or a little smaller than a half-gallon milk jug. It can sit on your countertop, right next to your sink. How easy is the Turapür to install? Very easy, and you don’t need a plumber. 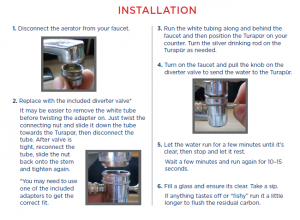 It takes just minutes because the Turapür can hook up right to the nozzle of your sink faucet, as long as the faucet isn’t customized in such a way where the nozzle isn’t adaptable (such as a spray nozzle). Click on the image to view installation instructions. Does the Turapür require electricity or have any moving parts? It works simply by turning on your sink and running tap water through it, and has no moving parts. How long does the Turapür filter last? 500 gallons, which might be six months for an average family. How much are replacement filters? You can purchase a single replacement filter from the button above. A single replacement filter is $129 plus $7.95 shipping. If you purchase a Turapür today through the order button above, you’ll be offered the opportunity to get replacement filters for $99 and free shipping. Will I get clear instructions on how to start using the Turapür? Yes, in every Turapür package we send out, we include very clear instructions on how to install the Turapür, including pictures. You can also find videos online. The whole process takes just a few minutes. If I have questions or am unsure about anything about the Turapür, can I speak to someone on the phone? Absolutely. Immediately after joining, we will give you a special customer service number that you can call with any questions you might have. You’ll also get a special email address for the same purpose. We want our members to experience the world-class service they deserve. But please note we can’t provide personalized medical advice. This water ionizer will transform the water you and your family drinks, and may be one of the best choices you make in your life when it comes to your health. You saw the demonstration showing how the most popular bottled water brands are oxidizing, and Turapür water is an antioxidant for your body. If you’re still not convinced that Turapür is a valuable addition to your household and your health, honestly it’s probably best you pass on this opportunity and let someone else who’s ready to improve their health, claim their Turapür today. It is fast, safe, and 100% secure. We are using the latest complex encryption technology available to protect your data though the entire ordering process. It’s the same type of encryption technology used by giant online retailers such as Amazon.com and also utilized with most banks’ online banking technology. After the water cleared I noted a slight effervescence - almost a tingling feeling on the palate. I don't know why but I've found my energy levels are higher. I don't need that nap after work like I normally took. Since I inserted the Turapur, it's the first time I've drank "tap water" in years. No more odor from the tap. I'm saving money from no longer buying bottled waters and drinking clean water from the tap! Plus if I move, it comes with me. I noticed the water was fresher tasting and have drunk more water then before. Alot better than the bottle water or even the purified water I have attached to my sink. I've noticed an increase in my energy levels after a few days. I don't drink coffee anymore, except on occasion, and I used to drink it all the time.I have a cup of green tea for breakfast, and the rest of the day I am happy with water! The water seemed clearer. It is early as yet but I think I feel a little stronger and more energetic. I have had trouble drinking plain water before. I just didn't like the taste. This water taste fine to me and I have no problem drinking it. My Turapur was easy to install and is very convenient. Since I am comparatively healthy at 88 I still think it will improve my health. The water taste is great and there is no loss of water.